Nicole Richie graces the cover of the October 2010 issue of UK magazine InStyle. Nicole Richie wears the Winter Kate 'Duke' jacket on the cover on InStyle. Nicole chatted to InStyle about her young Hollywood life, her 9 tattoo's, family, pregnancy and how Harlow is turning into a mini fashionista! And then there’s Joel. Their engagement was made public by a Twitter confirmation in February, although it happened long before then. “Yeah, we’ve been engaged for a while so your [sic] all kind of late on that. But thanks for the hoopla all the same,” Joel tweeted. Nicole says that the wedding is still on and, of course, she’s excited! Nicole doesn’t seem one for tortured self-analysis – a favoured pastime of the Hollywood A-list – and it’s refreshing. She does, she says, do most of the cooking in the Madden-Richie household and her diet isn’t anything more special than “home-cooked and very, very healthy... and made with love”. She mentions having a home full of people and throwing dinner parties. Has she turned into a domestic goddess? “Well, I don’t have a hat and apron... but I entertain at home a lot. I love cooking for other people. Two-year-old Harlow is already showing an inherited passion for fashion. “She picks her own clothes. It’s a 20-minute thing – it begins at 7.30 each morning – but it is what it is and it’s fine,” she smiles with a mock roll of her eyes. Other than that, family life is only referred to in general terms. She mentions having a home full of people and throwing dinner parties. What do you think of Nicole Richie's tough look for the InStyle photoshoot? You can read Nicole's full interview and see the photoshoot in InStyle magazine - on newsstands now! 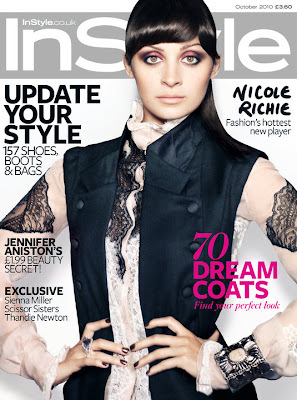 Head over to InStyle.Co.Uk to see more on Nicole Richie. so this instyle mag is only in the uk?